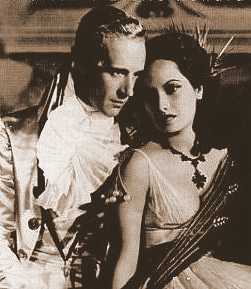 "Quick, your majesty! Into the sewer!" "I'll see you in the tunnel!" The work was started immediately and then interrupted in 1855 for technical reasons as well as the fact the revolutionary turmoil was moving faster than the people with shovels. The entire kingdom was about to be engulfed in a war to resist Garibaldi and subsequent incorporation into a united Italy, a war that the Bourbons ultimately lost. 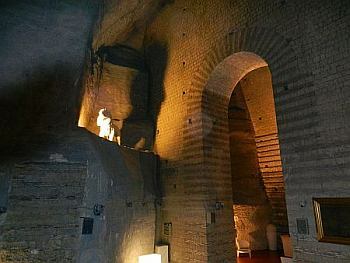 The end of the tunnel at via Domenico Morelli had the advantage of some "starter" caves to work with. These had actually been quarries used to provide blocks of tuff rock for the many Spanish villas and churches that sprang up in the 1500s and 1600s in the area. Thus, one finds inscribed dedications from as early as 1512 of a villa belonging to one Andrea Carafa, count of San Severino, and, from 1588, the quarry that provided material for the church of the Nunziatella (converted into the Bourbon military academy in 1787). The tunnel was left in an unfinished state, that is, without an exit near the royal palace, until 1939, when the Fascist government decided to convert it into an air raid shelter (see item #3, below) The entrance was on the north side of Piazza Plebiscito from the building that now houses the Naples prefecture. After the war, the entrance was covered and forgotten about until 1968, when local urban spelunker Clemente Esposito uncovered it. The numbers are impressive: the original Bourbon tunnel plus the earlier Spanish quarries plus the aqueducts converted to air raid shelters (possible only after the new Naples aqueduct in the late 1800s had made them no longer necessary ) come out to 10,000 square meters (that is, 10 sq. km or six square miles). Until the 1970s the underground area was used as a "Municipal Deposit." What that really meant was a place to dump the enormous amounts of wartime rubble. This includes not just the bricks of bombed-out buildings, but cars, motorcycles, old refrigerators, statues, and, generally speaking, accumulated broken bits and pieces of centuries of Naples. 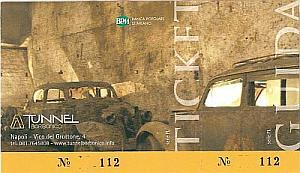 An exhibition about the tunnel was put on at the Castel dell'Ovo a number of years ago. One awaits further news of some final disposition of this latest addition to what Neapolitans now call "the other city," by which they mean the 700 (!) quarries and many miles of ancient passageways beneath the surface. An organization called Borbonica sotterranea is pushing ahead with the clearing and cleaning up of the ex-Bourbon military tunnel beneath Mt. Echia. They have produced a good video of their efforts to date; the video is at this You Tube link. The hard-hatted gentleman's explanations are in Italian, but they more or less tell the same story as item#1, above. There are some interesting sidelights in the video, however, such as the addition of a row of late WWII latrines put in when the tunnel was used as a bomb shelter. Also, you can see the abandoned cars and other detritus dumped into the tunnel in the mid-1940s. The particular FMS that has the papers oohing-and-aahing seems to be what is left (photo, above) of the monument to Aurelio Padovani (1888-1926), an early Neapolitan Fascist trade unionist who participated in Mussolini's march on Rome in 1922. The monument to him had stood in the square in front of the church of Santa Maria degli Angeli (now the site of ongoing construction for a new metro station). The papers have announced the opening of the splendid new Morelli parking structure; it is dug into the side of Mt. Echia, a few yards from the west exit of the Galleria della Vittoria car tunnel one block from the Villa Comunale. The entrance to the structure is totally inconspicuous; within, however, it is a seven-story affair with 250 long-term rental spaces and 230 hourly slots. More impressive for our purposes, however, is that the entire affair occupies the western entrance to the old Bourbon Tunnel, which has now been opened for public tours; thus, another bit of the "city beneath the city" is now accessible to tourists who fancy themselves mole-people. That is your mantra if you decide to go on this tour. 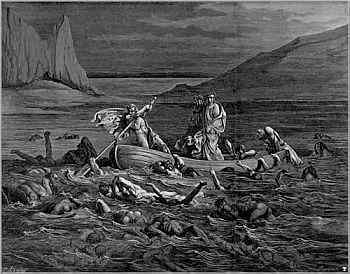 And the little guide in the hard-hat might not be Charon taking you for your last boat ride, this one to Hell. Indeed, since my last visit (item #3, above) the troglodytes of Borbonica sotterranea have been hard at work burrowing out their domain beneath Mt. Echia, the hill upon which the original Greek city of Parthenope was built before there was a Naples. The most recent activity has involved bridging the spaces of the Bourbon Tunnel (described in the entries, above) to an adjacent and more recent space, this one a 400-meter tunnel started in the 1980s and meant to be part of the original Rapid Tram Line (RTL) which was to be ready by 1990 in time for the Naples matches of the World Cup that year (see this link). That flopped, both as soccer and engineering. Italy lost to Argentina in Naples, and the RTL tunnel was partially built but never completed. (The stretch of tunnel running in from near the stadium in Fuorigrotta has, however, since been incorporated into the new Line 6 coming into Naples from the west. That section is now up and running as far in as Mergellina.) From the downtown end of that RTL project, however, they started to tunnel beneath Piazza Plebiscito (the square in front of the Royal Palace). The idea was to head west and meet up with the line coming in. Assuming they didn't pass each other like moles in the night, there would then have been some grand Transcontinental Railway Moment; they would drive a golden spike, perhaps, and fans could then get out to the matches in Fuorigrotta. Could they do all that in just a few years? No. 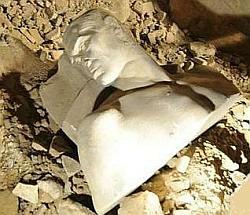 The whole project gave up the ghost, and the partially completed tunnel beneath Piazza Plebiscito was abandoned. When I said "bridging the spaces," that was only partially a metaphor. It isn't a bridge; it's a small barge—or a large raft. (There is standing room for about a dozen persons.) 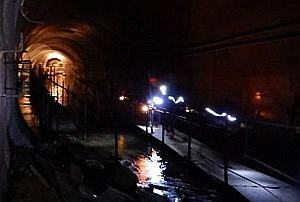 Lower sections of the Bourbon Tunnel already had water in them—not seawater, by the way; it's fresh water fed by the same subterranean sources that fed the old reservoir system (mentioned in the entries above). There was about a 40-meter-wide pool of water between the chambers of the Bourbon tunnel and the abandoned RTL tunnel, so Borbonica sotterranea built a shaky raft dock on both sides. That is the ride you can now take—not to hell, but rather to one hell of a waste of taxpayers' money. You step off into a very large space well beneath Piazza Municipio. There is no exit at that end and, as far as I know, no plans to build one. The space is huge, an unused quarter-mile of modern subway tunnel with no future. It is not even to be used as part of the incoming #6 subway line, which is digging its own tunnel. Since the heavy lifting (or digging) has already been done, they should use the space for something, maybe an underground Museum of Boondoggles connected by satellite to countless other such sites around the world. Since there is no clear passage up to the top and out onto the welcoming wide-open spaces of Piazza Plebiscito (although the original construction workers must have had one), you turn around, walk back, hail a raft and trudge back the way you came, all the way beneath Mt. Echia, the hill of ancient Parthenope. It occurs to me that if this were Finnish mythology, you could do all that on the back of a swan. After years of constant work, the Bourbon Underground Association will present the results at a press conference at 11 a.m. on 14 November 2015 on the premises of Palazzo Serra di Cassano on via Monte di Dio n°14 in Naples. The new sections were uncovered and made accessible to the public thanks to president Gianluca Minin, vice-president Enzo De Luzio, and a great number of volunteers who have pitched in over the last few years to dig out and clean this part of the netherworld of Naples. Even in a city where ancient underground bits and pieces keep popping up (Roman boats! Greek tombs!) this type of restored structure is a novelty for the public, perhaps because it relates to a relatively recent period of local history (as you may read, above). Indeed, public curiosity and admiration for the work undertaken to restore the tunnel (also "Gallery) continue to grow; the so-called "Galleria Borbonica" goes back to 1853 and the reign of Ferdinand II of Bourbon. I am indebted to Clemente Esposito and his article "Il Tunnel Borbonico" on the website of Napoli Underground, by whose kind concession the photo of the tunnel in item #1 appears on this page. I thank (at least I think I do) Fulvio Salvi of Napoli Underground for having shanghai'd me onto the tour described in item #4 and for constantly whispering in my ear: "The walls are not closing in on you...not closing it on you...not... I repeat, if you don't like the dark, water, tight spaces or gloom (in whatever order), don't go. 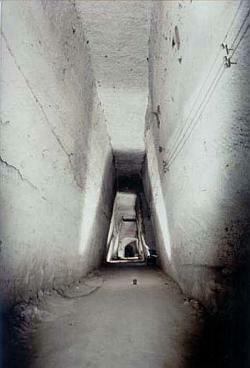 (Also see various entries in the Portal for Underground Naples.